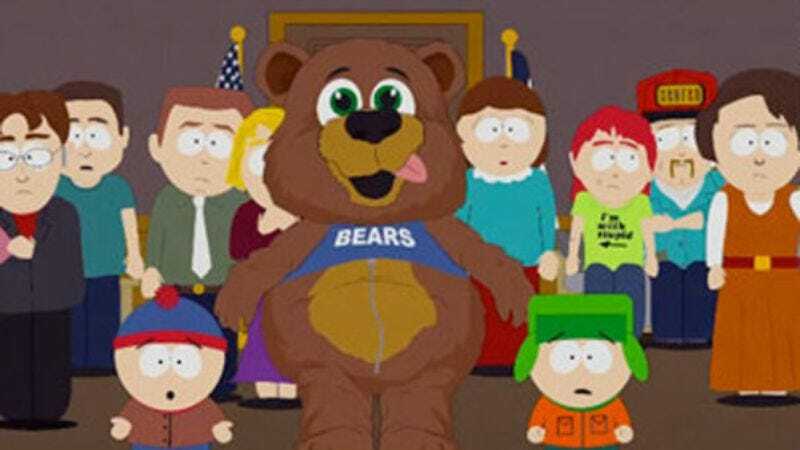 In a story that’s wrapped in several layers of irony while also being somewhat alarming, FOX News is reporting that a radical Islamic website has warned South Park creators Trey Parker and Matt Stone that they could face violent retribution for last week’s episode, which featured the prophet Muhammad in a bear suit. South Park’s “200” revisited the controversy of depicting Muhammad in its typically self-aware way, with characters worrying aloud that even having him completely hidden inside a U-Haul or deep within a furry costume would be enough to invite retaliation from Muslims, who aren’t exactly keen on seeing their prophet in cartoons, not even in a wink-wink, nudge fashion. Reached for a follow-up by FOX, the author of the post said he was just trying to “raise awareness.” Among the choicer comments on the article from newly aware readers: “May Allah never guide them until they taste the fire of hell.” “There’s no doubt our Mujjahid Brothers from among the state itself will rise and kill them.” “I wish I could slit their throats with a rusty knife.” And we thought the comments on our South Park reviews were bad! Yuk yuk. But seriously folks, that's kind of unnerving.